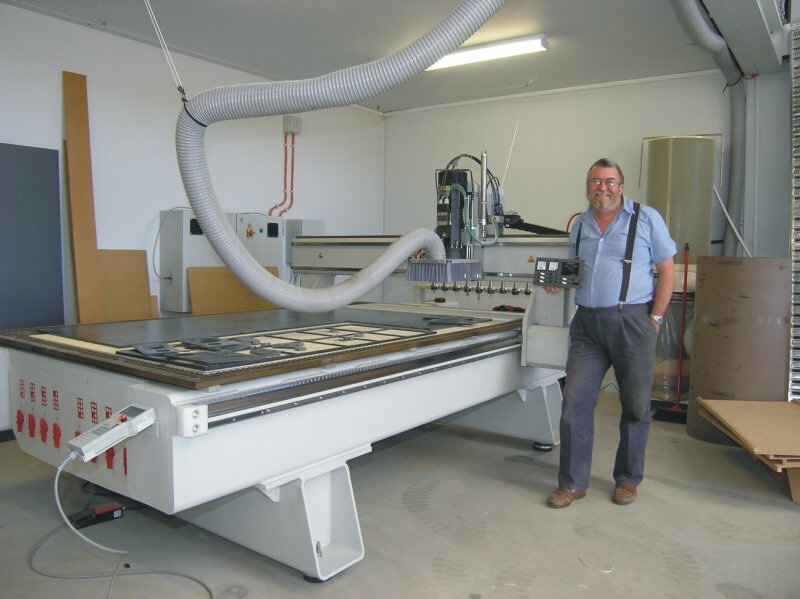 What is a "CNC Router".. and how does it work? Thats Gary Pacy of OutBack Marine showing off their router and showing what it can do. They do instrument panels and other goodies for the production boat trade and custom craft. The panels are so clean in manufacture they appear to be a fine injection moulding rather than cut from solid stock. The table part that looks like an Air Hocky table (remember those) allows objects up to 4X8 foot (1200X2400mm) to lie flat. The deck above it slides the length of the table and the cutting head traverses the width, enabling any point on the table to be operated on. Various rotating cutting bits can be mounted depending on material and cutting size or shape. The computer program is done conventionally on a remote machine or supplied by the client. The program I saw Gary using was very similar to what this paper is produced on. The pattern is then sent via cable to the machine and it sends the deck around the machine with very close tolerance. Thus an image on a computer screen can be manifested in hard material in seconds. The big tube above the machine is dust extraction. These little gems go for from say.. $15,000 second hand for a basic machine to over $100K for one like Garys shown here. This machine can turn any boat building material into a "kit"! Plywood? No problem. It can cut the ply to shape as accurate as your supplied dimensions. Any laminated panel can be cut ready for mounting. Unlaminanted panels like polycore or foam? No problem. Mount a drawing toll on the head instead of a cutting tool. Your boats panels are lofted in a couple hours, as fast as the machine operator can feed them in. Then it's a matter of cutting with your box knife. Builders I observed trimed outside the marked lines a little then trimmed to exact measure after laminating but while the resin was still green enough to be easy cutting. See how this router has aided in the construction of a new design of production boat. The important thing is to choose your materials on their merits, not on who seems to have the market for kit cutting cornered... if your designer refuses to supply the cad drawings to an independent CNC router operator.. maybe it's because there are hidden commisions at play.